Activist Wayne Kublalsingh is taking a stand against the government and he is doing so through a hunger strike. Kublalsingh is protesting, among other things, the Highway to Mon Desir Re-Route that is likely to affect the lives of several families in the area. 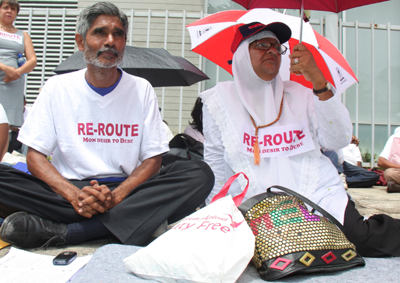 To date, Kublalsingh and the members of the Re-Route Movement have been able to thwart the government. But Kublalsingh and the ReRoute Movement continue to struggle in anonymity. Yesterday at NAPA I engaged a person of the upper class in discussion about Kublalsingh's Hunger Strike, and her response was she understood the cause but she felt Wayne must be going mad. I then asked if she didn't think that the atrocities the government has been committing worthy of a fast....and she went silent and refused to be pulled into discussion again. I mean seriously, isn't the state our country is in worthy of a fast? I for one will be going down to the PM's Office in St. Clair this week and sitting in solidarity with Wayne Kublalsingh. 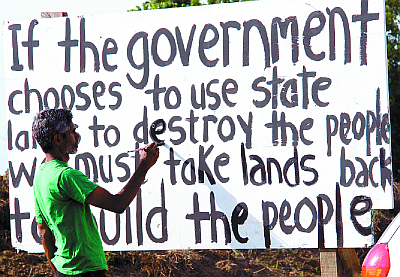 For those of you who still have a conscience, still care about nation building, and less concerned with sitting at the trough and eating ah food meet Wayne and other members of the Re-Route movement any day this week outside the PMs office from 9 am!